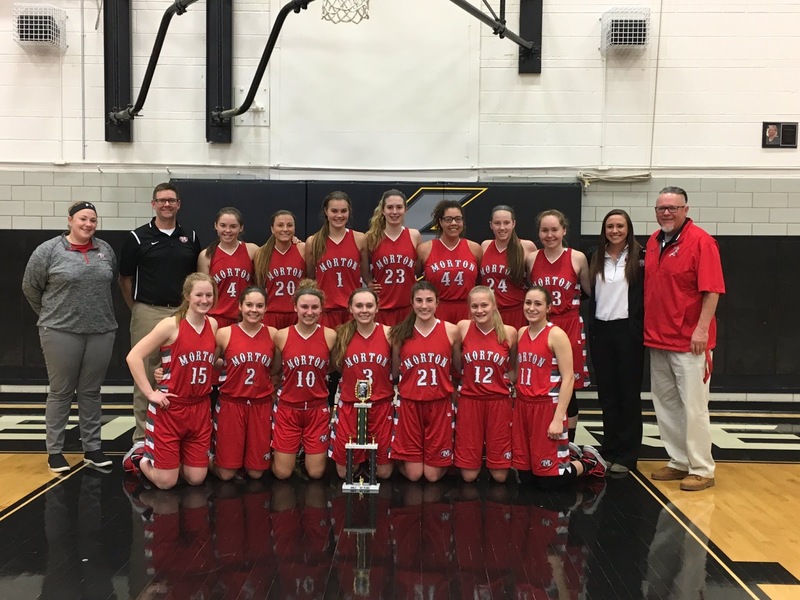 Galesburg, IL - It was a trip up I-74 for the Morton Lady Potters (23-1) (9-0) Saturday, as they took on the Galesburg Silver Streaks for the Galesburg MLK Tournament title in John Thiel Gym. The game started out with the momentum slightly favoring the hosts, but Morton got going, and when they get going, it's hard to stop them. Morton Head Coach Bob Becker knew the opening stretch by Galesburg wasn't going to factor into the game's result. "You're not going to lose the game in the first couple of minutes. It took our girls a couple of minutes to say 'hey, let's amp it up on the perimeter', because our strength is beating people up and making them uncomfortable." By the game's first timeout, called by Galesburg roughly six minutes into the game, Morton had taken the 12-10 lead. Morton would outscore the hosts in the last 2:06 of the opening quarter to take a 18-13 lead after eight minutes of play. Tenley Dowell led the Lady Potters in scoring in the first with six of her 17 points. The second quarter saw the Lady Potters defense step up and make the shot opportunities tough for Galesburg, as the Silver Streaks only saw three shots go in the hoop in the second, totaling six points, whereas Morton had four different players in the scoring column for the quarter, led by Kassidy Shurman's, who scored five of her eight in the second. Behind that defensive effort, Morton would hold a 14-point lead at halftime, 33-19. The Lady Potters would also dish out 10 first half assists. The third quarter belonged to Lindsey Dullard. 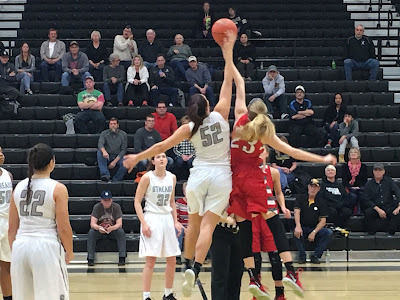 The sophomore had 11 of her game-high 24 points in the quarter, and Morton kept Galesburg right where they were at the half, as the Silver Streaks saw their best offensive quarter, scoring 15 points in the third, but there was just too much Morton. 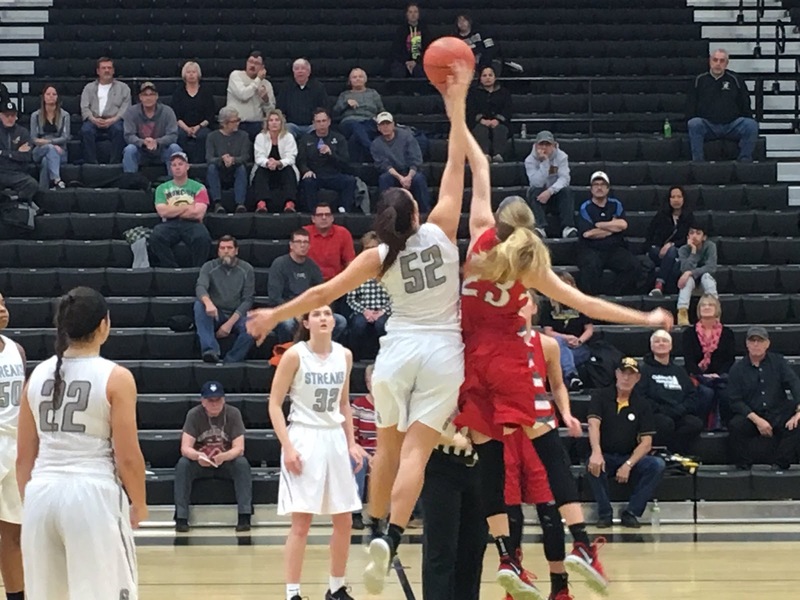 It didn't help the Streaks that their post players Yvonne Mixon and Emily Meinert both started to get into foul trouble. Dullard said that the team knew what to do when Mixon and Meinert started getting the foul count up there. "We knew to take it at them to make them get more fouls and hopefully sit on the bench." Coach Becker praised his offense when it came to the Galesburg foul trouble. "That's a credit to our offensive end. We've been trying to get spread out. If we give ourselves gaps to drive in, we have so many versatile kids that can drive it, can shoot it. It's a challenge for other teams to guard all five of our girls on the floor." With just 10 minutes remaining in this one, the visiting Lady Potters held a commanding 18-point lead over Galesburg, 52-34. The final quarter was time for Morton to use their depth off the bench, as Coach Bob Becker would eventually get all 14 of his players in the game, and Morton would roll to a 19-point win over Galesburg for the Lady Potters' 23rd win of the season. Lindsey Dullard finished with 24 points for Morton. Tenley Dowell was also in double figures, winding up with 17 points. Thus, the two combined for 41 points, while the entire Galesburg team scored 46. The final score favored the three-time defending state champions, 65-46. After the game, Coach Becker had a lot of good things to say about both Dowell and Dullard. "Those two are fantastic. They had a great tournament. They had a great day today. We ran a couple of sets where they were involved in a two-person game, and they did a tremendous job. They're tough to guard." Dullard thought she was able to work her game pretty well. "I was looking to drive a lot more, taking the defender off the dribble. We were really spaced out, and weren't really in the middle." Dowell thought the shooting was right where it needed to be Saturday night. "We were just driving, and the defense just sagged in on us. Everyone was pretty much making them (shots). Lindsey (Dullard) and Kassidy (Shurman) were making a lot of threes." Coach Becker takes this stretch of games, tournament and otherwise, as a learning experience. "This is our eighth game in two weeks. We learn a little bit about our team. There's a layer of toughness and grit that develops." Becker also thinks that his squad was very balanced throughout Galesburg's MLK tournament. "We got some contributions from all 14 kids throughout the tournament. We got to utilize our depth from our bench. We're getting better all the time." The 19th-year head coach says they're just about where they need to be. "We're getting closer and close to putting together a full 32 minutes of Potter Basketball." Morton's next game is Tuesday, hosting Dunlap, for their annual Pink Game. It usually draws a sizable crowd, and Tenley Dowell is excited for it, but also knows that they're up against a talented team in Dunlap. "We sold a ton of shirts (650+ is the estimated #), so that will be good. Dunlap's pretty good, so we're going to have to come out and play hard." The Pink Game tips off at 7:00 pm Tuesday from the PotterDome. Morton's Lindsey Dullard puts up a shot in the game earlier in the day Saturday against Peoria Notre Dame.